LEADING ASSISTS: Bulls: Grant 10 assists. Pistons: Griffin 3. CCI 24 SECONDS COMMENTARY: Too much Pistons' three point shooting. Too much Andre Drummond. The Pistons led wire to wire leading by as many as 27 points. 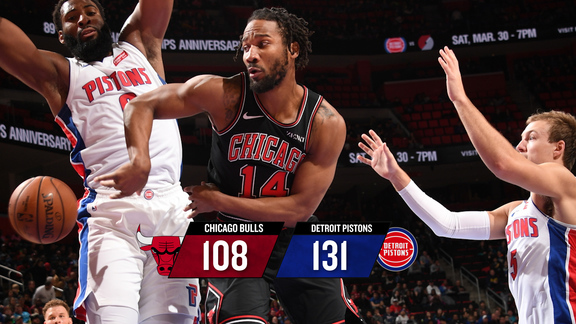 Detroit set outstanding screens allowing the Pistons to apply pressure on the Bulls defense draining eight, three point field goals in the first quarter. CCI STAT OF THE NIGHT: 15-20-4-4-4-0. Andre Drummond 15 points, 20 rebounds, 4 assists, 4 blocks 4 steals and 0 turnovers in 36 minutes. WOWZA. It was his 55th double-double of the season. Every Bull ( Asik DNP-CD) played ten or more minutes. Seven double figure scorers led by Denzel Valentine with 18. Jerian Grant with a double-double of 10 points- 10 assists. Up next: At Houston Tuesday. Houston 114 NOLA 91. A franchise record 59 wins for the Rockets who host the Bulls, Tuesday. Clint Capela with 18 points, 16 rebounds and 6 block shots. He has grabbed 15 or more rebounds 11 times this season after doing so just once prior in his career. Philadelphia 120 Minnesota 108. Ben Simmons with a 15-13-12 game. The more I see of him, the more I see another Magic Johnson and I'm serious . The 76ers are 12 games over. 500 for the first time since 2002-03 season. Another game for Memphis and another loss. Lakers 100 Grizzlies 93. The Lakers won despite having only eight available players. Kyle Kuzbass with 25 points and 10 rebounds. Orlando 105 Phoenix 99.. Let's move on. Steph Curry suffered a Grade 2 MCL sprain during Friday's win over Atlanta. He will be re-evaluated in three weeks. Boston's Kyrie Irving out 3-6 weeks following knee surgery. Congratulations to Loyola. Chicago is so proud of you. On to the Final 4. THE sports story of the year.